The Supreme Court held that a Licensed Surveyor under Section 18A of the Karnataka Land Revenue Act would be treated as “public servant” for the purposes of Prevention of Corruption Act, 1988. Supreme Court refused to expunge some remarks against a judicial officer made in a Rajasthan High Court order and upheld a disciplinary enquiry against the judge based on the said order, apparently for not obeying the dictum in the apex court and high court orders. Supreme Court refused the plea of a student who had obtained admission in a medical college without clearing NEET. RishabhChoudhary had got admission in a medical college after he cleared the examination CGMAT-2016 conducted by the college and supervised and monitored by the State of Chhattisgarh. A bench headed by Chief Justice J S Khehar dismissed a PIL which challenged the advancement of the Union Budget to February one ahead of the upcoming Assembly polls in five states saying that was no valid argument to corroborate how it will influence voters in the five poll-bound states. Supreme Court extended the free ride on Delhi-Noida DND flyway for another eight weeks. A bench headed by Chief Justice J S Khehar also gave two more months’ time for the Comptroller and Auditor General to complete the audit the accounts of the Noida Toll Bridge Company to ascertain if they have already recovered the cost and reasonable profit from the Delhi-Noida DND flyway. The Supreme Court refused to admit a public interest litigation which soughta direction to the Centre to frame a uniform policy to protect and preserve cattle and save them slaughtering and smuggling. The famous M C Mehta Vs. Union of India, a PIL filed in 1985 seeking measures to clean up the Ganga will now be heard by the National Green Tribunal and not the Supreme Court. 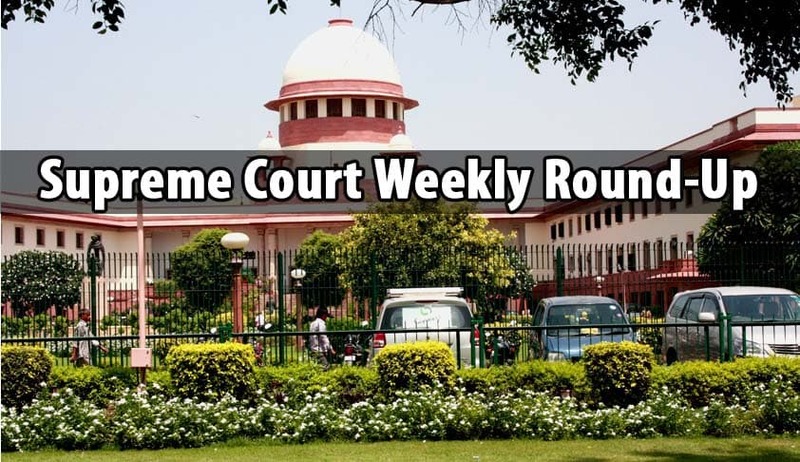 The Supreme Court bench comprising the Chief Justice, Justice J.S.Khehar, and justices N.V.Ramana and D.Y.Chandrachud, today gave the Central Government four more weeks to fill a vacancy in National Human Rights Commission, which has remained unfilled since March 1, 2014.